Police say she attacked an officer with a machete. If she seemed on edge, it may have had something to do with all the swords and knives on her walls. Hernando County Sheriff’s deputies paid a visit to the Brooksville, Florida, home of Nickole Dykema after her neighbor, Dorothy Clagg, complained that Dykema slashed her window screens and air conditioner with a large knife. “She never wanted anyone to go in her house, and now I know why,” Clagg told WFTS. Investigators told WTSP that Dykema refused to let the deputies into her home, so they forced entry. 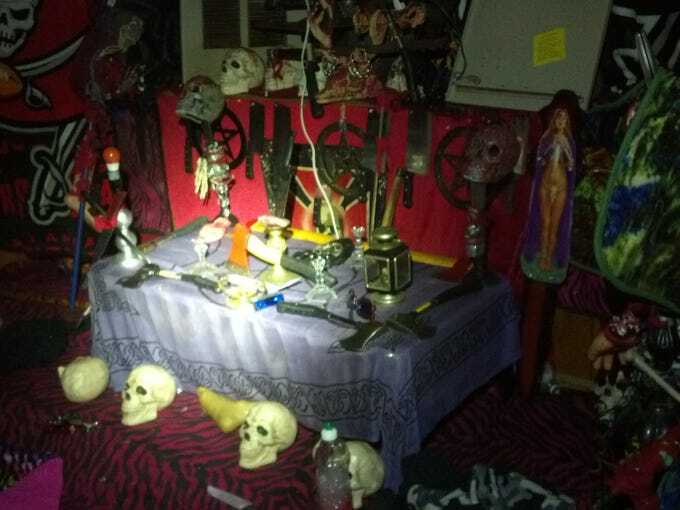 There, they found more than 3,500 machetes, swords and knives hanging on her walls, along with Halloween props like rubber masks and fake body parts. Photos show some of the weapons arranged around a shrine. Police said Dykema took a machete and slashed at a deputy with it, narrowly missing his head. She then ran and hid under a blanket in another room, waving a long sword in front of her, according to WFLA. Dykema, who is on probation after being caught shoplifting knives from a Dollar Tree store in December, isn’t allowed to own weapons, WTSP reports. Police used a bean bag gun and a stun gun to subdue Dykema, then took her into custody. Her neighbor, Dorothy Clagg, says she’s glad Dykema is in jail. Dykema was held without bond on charges including probation violation, property damage, criminal mischief, and assault on an officer. Next PostNext (eonline) – North West Doesn’t Cry at Kanye West’s Fashion Show This Year, But She Did Manage to Interrupt It Again—Get the Details!